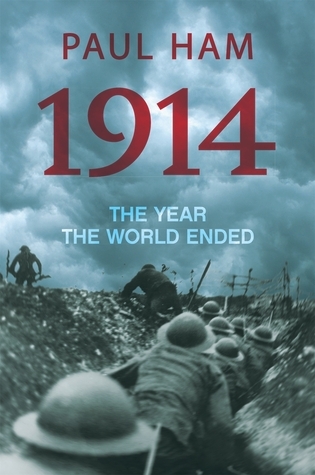 In 1914: The Year the World Ended, award-winning historian Paul Ham tells the story of the outbreak of the Great War from German, British, French, Austria-Hungarian, Russian and Serbian perspectives.Along the way, he debunks several stubborn myths. It is hard to believe that in August it will be 100 years since the beginning of the First World War. This book 1914 takes a look at all of the causes or so called causes of the war. The author starts back 100 years and works forward with all of the different wars that had taken place. But I did notice he always came back to a treaty after a war in 1870-1871, where some prime land was taken from Germany and made French. Over the course of years this became just one of the items that upset German leadership. They also felt that they were always being pushed aside when other countries got together for a conference or would sign a treaty. In 1900 France and Russia signed a treaty and they both bordered Germany. Feeling pressure at this time Bismarck started to build up his army and his Navy. Surprisingly none of the other countries were paying any attention. From that moment things just got worse because he died and a younger Bismarck came into power and Russia had a change in power. Now France made an agreement with Britain about territory in North Africa and once again Germany was left out. Though the Queen of England was the Grandmother to the new leader in Germany she had no say over what the country did the Parliament along with the Prime Minister really controlled the political landscape and no one was really listen to what Germany had to say. There was in 1908 some talk between two diplomats, Count Alois Lexa Von Aehrenthal the Austrian foreign minister and his Russian counterpart Alexander Izvoisky. They were getting together because of an agreement was to expire on what to do with Bosnia. These talks went on for years with no solution other than the Austrians’ and Germans, feeling like they were being taken advantage of and no agreement was done in the end. During this time there was one time when the Russians sank a German vessel which actually could have led to war but was worked out. By the time Prince and his wife were assassinated there was no more time for talk. France and Russia had increased the railroads along the borders of Germany and with everything happening Germany attacked France. One thing I will say is that medical science from back then was that. The men who were in the trenches with sustained artillery attack. (Mostly affects the brain and central nervous system). Men who broke down were sent back to the front lines this was sane thinking. Today this we know is post-traumatic stress disorder. To abnormal events and shelling, mass slaughter is not normal but was deemed normal then. Many men after the war who spent a lot of time in the trenches had headaches, nightmares, and bouts of depression. This also does not include the men who served from mustard gas. The author also points out that that really he thinks both wars are really together for nothing was learned from the first. I would have say I agreed since my father fought on some of the very same land as the first war when he fought in WWII. This is a very in depth look into the begging’s of the first war. Not any battles but the history and politics and not just saying that the death of a Prince and his wife can start everything into motion. He takes you back into all of the changes of Europe leading up to that event and how each time when they could have talked they did not. I thought this was a very through book and was well written about an important part of history. I got this book from net galley.